This game was tucked away in the Rezzed area, but was easily one of the best of the show. Blending delightful humour with interesting story telling, the gameplay is a mash up of platformer and puzzle, in which users can use 4 different ‘quarks’ to power up, such as the ability to jump higher or create platforms. 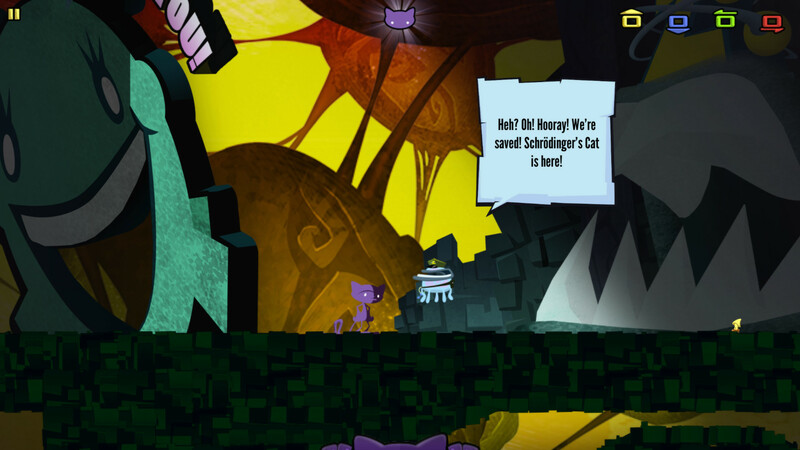 Schrödinger’s Cat takes place in a 2D colourful world, which is fun to explore. Accompanied by insane dialogue which is genuinely funny, it’s an absolute delight to run around in. Plus you’re a cat. Who doesn’t love cats? 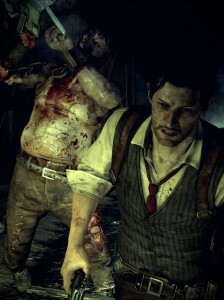 I’ve been hands-on with The Evil Within a couple of times now, at various events, and every time I’ve enjoyed it. This is the survival horror game going head-to-head with Alien: Isolation; both are launching in October. The Evil Within offers an experience that feels a lot like Resident Evil 4: you smash open barrels and boxes to find bits of ammo, but it’s always scarce. You can really feel the Japanese-style horror, with the somewhat typical (but still terrifying) horror girl – you know the type – long hair that drapes over the face. What really stood out in this game were the traps: some of them more challenging than others, but they constantly had me on my toes. Rooms require detailed examination in order to find the booby-traps; a simple minigame offers you the chance to disarm them and scavenge them for ammo parts. Lords of the Fallen is a game that’s had my interest for a while but perhaps hasn’t had the campaign behind it that it really deserves. 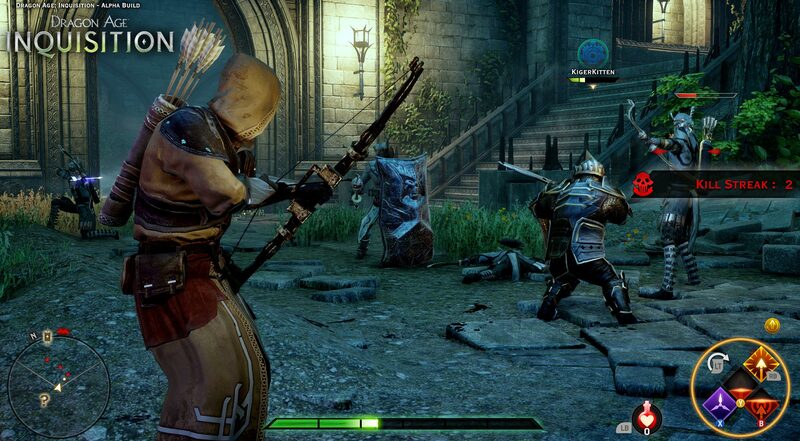 It’s an action RPG with a bit of a Dark Souls feel to it; you can roll out of the way and block attacks in the same way. The game encourages using the surroundings; a heavy enemy fell to his death after I lured him on to weak ground. The problem is that although the map offers opportunities like this, the emphasis on environment can make the combat system suddenly redundant; when battling on narrow stairs, for example, you can just try and make the enemies swing for you, roll out the way, and watch them fall down the stairs: hilarious the first time, but gets really dull really quickly. 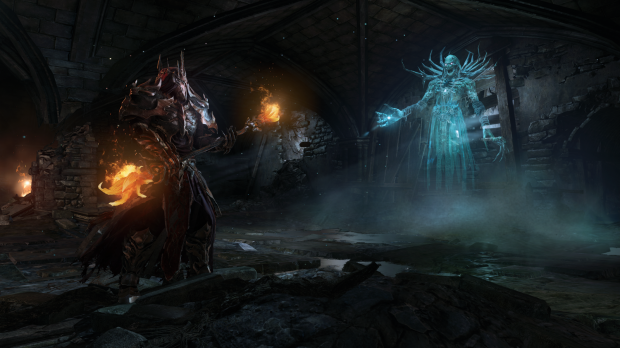 The game’s success will live or die on whether the environment helps or hinders the gameplay. I’ve been a long-time RuneScape player (seriously, half my damn life). When I saw that Jagex were doing a Transformers game, I wasn’t sure what to think. The game is a world apart from Runescape; instead of an MMORPG, we’re playing in a third person shooter. I played a team match: obviously, the teams were Decepticon vs Autobot. The map was large enough to allow players to transform into vehicles and whizz around. But the really interesting part of this game is the map layout. It utilizes the typical MOBA layout: 3 lanes that run through the left, right and middle. The map is littered with buildings and cover, and because of this, feels very different. There are hidden routes between buildings and roof tops that allow great flanking. Each character has a unique set of abilities that offer things like buffs and healing. My character was also equipped with two weapons, a rocket launcher and SMG. This meant I could mix up tactics when in combat. I was a huge fan of Dragon Age: Origins, but hated Dragon Age 2. When I sat down to play Dragon Age: Inquisition, I was told we would be playing in four player co-op mode. I was disappointed: not having any friends, I hate co-op mode, and wanted to try single player. So I offered the developers a challenge: win me over on the co-op or lose my £150 pre-order. The four-player co-op game had me assume the role of the Elementalist, a powerful mage. He had a few spells, obviously all tied to elements. But the interesting mechanic was mixing them up: freezing an enemy then shattering them to pieces worked really well. The five-level crawl posed a real challenge, everyone had to work together, with tanks taking aggro and one of the mages throwing up barriers to defend the team. One of the sub-bosses even used spells to split up the team, severely weakening us, which was an interesting and unexpected AI tactic. My pre-order still stands. I can’t wait to try out the single player.